A Chinese man has been jailed for a year for stamping on a portrait of Mongol ruler Genghis Khan, after being found guilty of inciting ethnic hatred. The court in China's Inner Mongolia region was told the man, identified by his surname Luo, had filmed himself trampling on the picture in May. The 19-year-old then circulated the video clip online, causing public discontent, according to reports. 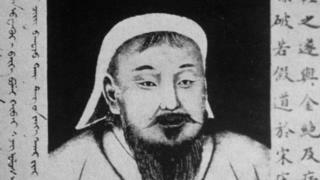 Genghis Khan remains a revered figure among ethnic Mongols. Genghis Khan: Could satellites help find his final resting place? State news agency Xinhua said Luo had been found guilty of inciting ethnic hatred and ethnic discrimination by the court in Ordos city, in the autonomous region of Inner Mongolia where the incident took place. Citing a local public security bureau, news outlet The Paper reported that Luo had uploaded a video of himself "stomping and insulting" the portrait to popular video platform Kuaishou, and also circulated it widely to groups and friends on the WeChat messaging app. The move prompted a strong reaction and several police reports. Authorities have since removed the video. Luo apologised during his trial for harming public sentiment. Genghis Khan was orphaned at the age of nine and became undisputed Mongol leader in 1206. He went on to build a vast empire in north-east Asia in the 13th Century.